Red Bull Super League Rally Point – League Of Legends Meet! Dec 2nd! Game Guys > Events > Red Bull Super League Rally Point – League Of Legends Meet! Dec 2nd! On December 2, join Super League at your local LAN center for our Red Bull Super League Rally Point party! 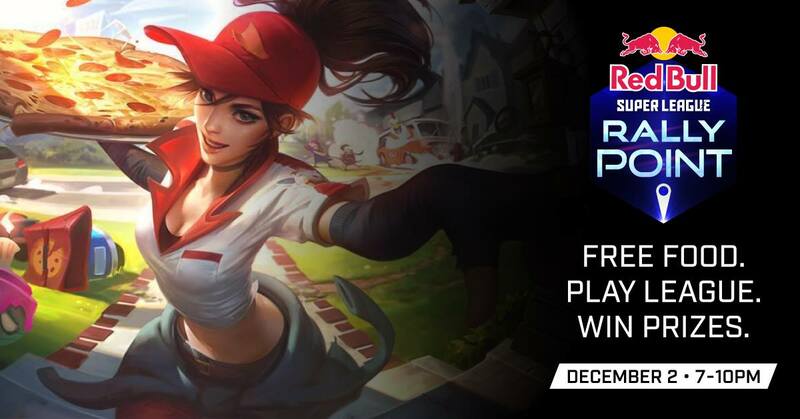 Enjoy a night of free pizza and gameplay alongside fellow League of Legends players in your city, compete in 1v1 tournaments hosted by your local Action Squad to win RP codes, and enter a comic-drawing contest for your chance to win an official League of Legends figure! Entry, pizza, and gameplay is FREE for all Super League account holders. Just show proof of your Super League account on your mobile device at the door, or wear your Super League jersey, medal, or hoodie to the event. Don’t have an account with us yet? Make one for free at superleague.com! Gaming PCs are provided on a first-come, first-served basis. Check with your local LAN center for information about availability of PCs. Let us know you’re coming! RSVP by clicking ‘Going’ at the top of this event page.